Aug. 14, 2018: E-RAD is a new model of aviation radiation from Spaceweather.com and Earth to Sky Calculus. It can predict how much cosmic radiation a passenger will absorb flying on any commercial jet across the USA. 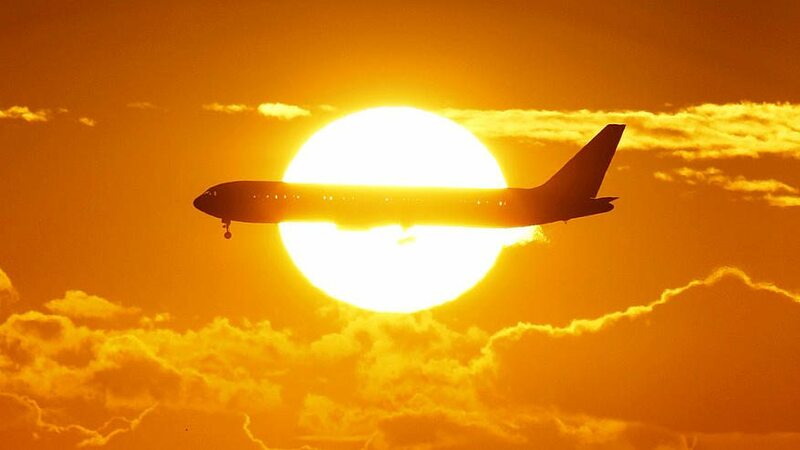 Researchers have long known that cosmic rays penetrate the hulls of commercial aircraft. At typical cruising altitudes, pilots, flight attendants and passengers typically receive a dose rate 40 to 70 times higher than natural radiation on the ground below. The higher a plane flies, the more radiation it receives. This has prompted the International Commission on Radiological Protection (ICRP) to classify pilots as occupational radiation workers–just like nuclear power plant engineers. Most people stepping onboard an airplane have no idea they are about to encounter cosmic rays–much less do they know what the dose rate might be. And that is where E-RAD comes in. 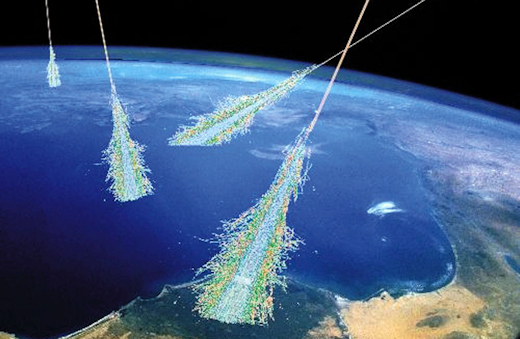 Enter a flight number and voila!–E-RAD predicts your exposure to cosmic rays. This new model has been years in the making. Since Jan. 2015, Spaceweather.com and the students of Earth to Sky Calculus have been monitoring cosmic rays in airplanes. Our method is simple: We board planes carrying the same cosmic ray payload we routinely fly to the stratosphere on space weather balloons. Inside the airplane we measure X-rays, gamma-rays and neutron dose rates, along with GPS altitude, latitude and longitude. Our data set is impressive. So far we have gathered 18,518 GPS-tagged radiation measurements during 72 flights over 2 oceans and 5 continents. We have spent 276.6 hours onboard planes taking data. These numbers are increasing rapidly with new flights every month. The E in E-RAD stand for “Empirical.” In other words, the model is based on real-life measurements, not theoretical calculations that might be wrong. Moreover, our data-set is fresh. Because it is constantly being updated, E-RAD naturally keeps up with variables that affect cosmic rays–for instance, the waxing and waning of the solar cycle and changes in Earth’s magnetic field. The blue curve traces radiation dose rates actually observed inside the airplane, while the red curve is E-RAD’s prediction. The two agree within 10% for most of the flight. These errors are constantly shrinking as we add new readings to our database. We are also improving our model outside the continental USA. Recent trips to Nepal, Hong Kong, Australia and New Zealand, have added hundreds of hours of new data to the foundation of E-RAD. Soon, we will be able to issue predictions for those areas as well. Stay tuned for updates from 35,000 feet. Note: Data from Sweden and several other US states are omitted for the clarity of the plot. We’re about to add a new country to the list: New Zealand. 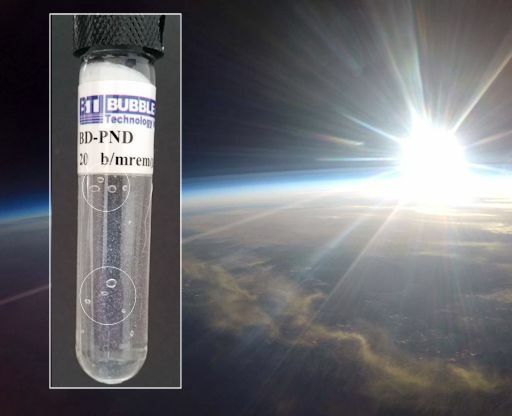 On June 18th, a team of students from Earth to Sky is traveling to New Zealand’s north island to launch 3 cosmic ray balloons in only 10 days. Soon, we will know more about cosmic rays above Earth’s 8th continent. Cosmic rays are, essentially, the subatomic debris of dying stars, accelerated to nearly light speed by supernova explosions. They travel across space and approach Earth from all directions, peppering our planet 24/7. When cosmic rays crash into Earth’s atmosphere, they produce a spray of secondary particles and photons that is most intense at the entrance to the stratosphere. This secondary spray is what we measure. The purpose of our mapping project is to study how well Earth’s atmosphere and magnetic field protects us from cosmic rays. As the plot shows, the shielding is uneven. More radiation gets through to the poles (e.g., Norway) and less radiation penetrates near the equator (e.g., Mexico). But there’s more to the story. Our launch sites in Chile and California are equidistant from the equator, yet their radiation profiles are sharply different. Chile is on the verge of the South Atlantic Anomaly, which almost surely distorts the radiation field there. Our flights over New Zealand may shed some light on this, because our launch sites in New Zealand will be the same distance from the equator as the sites in Chile. Stay tuned! Technical note: The radiation sensors onboard our helium balloons detect X-rays and gamma-rays in the energy range 10 keV to 20 MeV. These energies span the range of medical X-ray machines and airport security scanners. What is the Regener-Pfotzer Maximum? Image source: Phillips, T., et al. (2016), Space Weather Ballooning, Space Weather, 14, 697–703, doi: 10.1002/2016SW001410. What is this peak? To understand it, let us begin in deep space. Cosmic rays are, essentially, the subatomic debris of dying stars, accelerated to nearly light speed by supernova explosions. They travel across space and approach Earth from all directions, peppering our planet 24/7. When cosmic rays crash into Earth’s atmosphere, they produce a spray of secondary particles and photons that is most intense at the entrance to the stratosphere. Physicists Eric Regener and Georg Pfotzer discovered the maximum using balloons in the 1930s and it is what we are measuring today. In some ways, secondary cosmic rays are like froth on the ocean. By watching the froth, you can learn a lot about the underlying water. Likewise, by watching secondary cosmic rays, we learn a lot about primary cosmic rays hitting the top of the atmosphere. 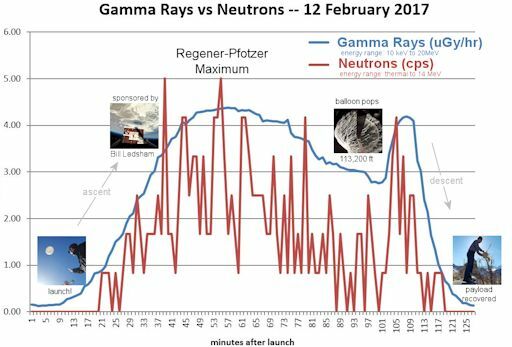 Indeed, our balloon measurements have recently confirmed what NASA spacecraft are finding: The cosmic ray situation is worsening. For many years, the Regener-Pfotzer Maximum was called, simply, the “Pfotzer Maximum.” Regener’s name is less recognized by present-day physicists largely because in 1937 he was forced to take early retirement by the National Socialists as his wife had Jewish ancestors. This interesting story weaving science, politics, and human nature has recently been told by historians of science P. Carlson and A. A. Watson. Ref: Hist. Geo Space. Sci., 5, 175-182, 2014. 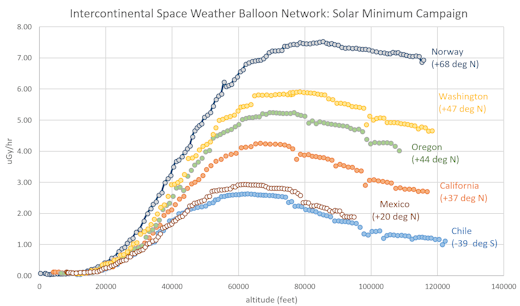 June 6, 2018: For the past two years, Spaceweather.com and the students of Earth to Sky Calculus have been traveling around the world, launching cosmic ray balloons to map our planet’s radiation environment. We’ve sampled deep space radiation over Sweden, Mexico, Norway, Chile and almost a dozen US states. This month we’re adding New Zealand to the list. On June 18th, a team of 11 Earth to Sky students and two mentors will fly from California to the north island of New Zealand, where we will launch 3 research balloons in only 10 days. Our hosts are Terry and Linda Coles of Enternet Online Limited (EOL), a leading New Zealand internet service provider based in Tauranga. EOL has been a supporter of Earth to Sky Calculus for many years. They sponsored one of our earliest balloon launches in 2013 when we flew their mascot, EVA the Cow, to the stratosphere. While we are in New Zealand, they will be donating all of our lodging and transportation. Thanks again, EOL! Not only will we be measuring cosmic rays, but also we will train New Zealand students to launch balloons, hopefully kickstarting a STEM balloon program in the southern hemisphere. Five schools are participating: 1. Mount Maunganui College; 2. Otumoetai College; 3. Tauranga Girls College; 4. Tauranga Boys College; and 5 Bethlehem College. Some of those schools will be sending their own experiments to the stratosphere alongside Earth to Sky radiation sensors. We can’t wait to get to New Zealand and share our adventure. Stay tuned for more information about what we hope to learn about cosmic rays by visiting the 8th continent. Feb. 17, 2017: In a joint operation on Feb.12th, the students of Earth to Sky Calculus and their sister club Earth to Sky Maritime launched a neutron counter to the stratosphere onboard a high altitude balloon. Neutrons are an important form of cosmic radiation because they provide much of the biologically effective radiation dose at altitudes of interest to aviation and space tourism. How are these particles distributed through our atmosphere? This is what we wanted to find out. This first data set shows that neutrons, like gamma rays, peak at the entrance to the stratosphere in a layer known as the Regener-Pfotzer Maximum. Moreover, neutron counts are significantly elevated not only in the stratosphere, but also at lower altitudes where planes fly (20,000 ft to 45,000 ft)–something to think about the next time you buy an airline ticket. We’ve been monitoring cosmic rays in the atmosphere for more than two years, and find that deep space radiation has been intensifying. Previous payloads measured only X-rays and gamma-rays, however. The addition of a neutron counter to the payload is a major upgrade, providing a more complete picture of the radiation environment. Stay tuned for updates as we improve our technique and gather more data in future flights. June 23, 2015: For nearly two years, Spaceweather.com and the students of Earth to Sky Calculus have been using helium balloons to monitor X-rays and gamma-rays in the stratosphere. Their successful program has detected multiple radiation events in response to solar storms. On June 18th they added something new. For the first time, the group’s Space Weather Payload included a bubble chamber for measuring neutrons. The device flew 109,012 feet above California’s Sierra Nevada mountain range, then parachuted back to Earth, landing near Death Valley National Park. The results: Neutrons were detected. Circled above are some of the bubbles that formed as neutrons passed through the chamber. By counting the bubbles, it is possible to estimate the total dose of neutron radiation absorbed during the 3 hour flight. The answer is 600 microRads (energy range 200 keV – 15 MeV). Interestingly, this is almost the same dose detected by onboard X-ray and gamma-ray sensors: 620 microRads (energy range 10 keV to 20 MeV). Lesson: if you only count X-rays and gamma-rays, then you are missing at least half of the radiation in the atmosphere. Neutrons matter, too. Indeed, neutrons are a very important form of cosmic radiation, providing much of the biologically effective radiation dose at altitudes of interest to aviation and space tourism. Low-energy neutrons also cause single-event upsets in aircraft avionics, especially devices that contain Boron 10. Adding a neutron sensor to the Space Weather Payload allows the students to monitor this type of radiation at altitudes ranging from ground level to 120,000 feet.